Allamakee County livestock producer, Ryan Collins, was featured in an article on the Iowa NRCS website. EQIP funds were used to help Collins set up a rotational grazing system including fencing to create paddocks, inter-seeded legumes, inter-seeded cool season grasses, water pipeline, and watering facilities with heavy use protection. 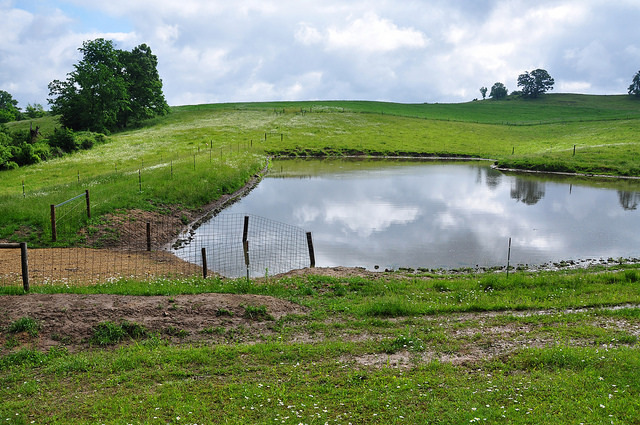 Because the cattle were utilizing a pond as a watering source, LuAnn Rolling, District Conservationist for Allamakee County, recommended fencing off the pond and allowing the livestock to drink directly from it using a fenced access ramp. This practice is becoming more popular because it prevents erosion around the edge of the pond, which would otherwise degrade the water quality and decrease the lifespan of the pond. The article can be found on the Iowa NRCS website or in the following pdf. If you would like to learn more about the EQIP program or have interest in setting up a rotational grazing system or a pond access ramp, please call 563-568-2246 ext. 3 or stop by the Allamakee NRCS office at 635 9th St. NW between 8 a.m.-4:30 p.m. Monday through Friday.